Last week, I was invited to attend a private view at Worthing College, as part of the Worthing Art Trail this year. 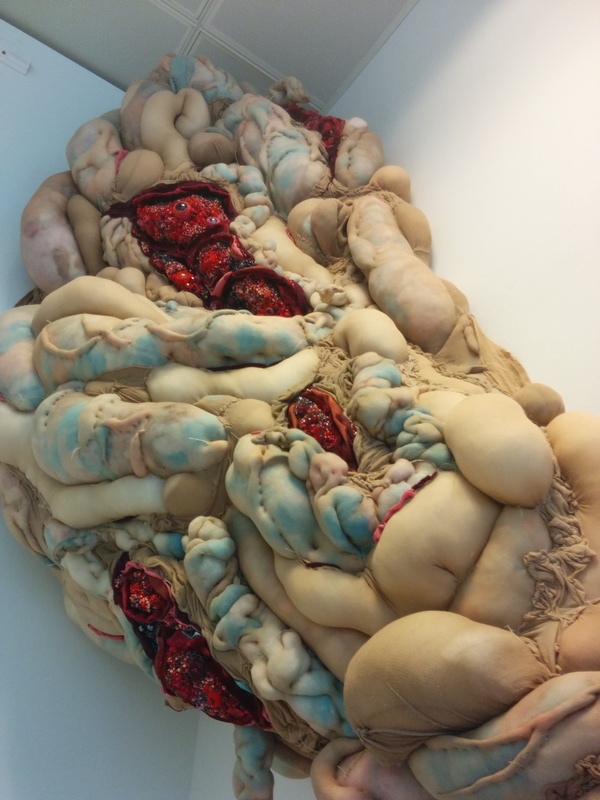 Having attended the Brighton University Graduate show, and been generally unimpressed with the artwork, I was apprehensive about the quality of work I was going to see. Really, I had little reason to worry as the work was very good. It was refreshing and bold to see artwork from 17 and 18 year olds displayed alongside lecturers and professional work. It blurred the lines between what “professional” and “student” work is and complemented each other well. Placing them on the same level elevated student work to professional artwork, giving them a chance to be judged as artists, and not just students. Each strand was made with knitted micro-filaments. My favourite student artwork came from the A2 Textiles, you could see the strong influence of Alexander McQueen in their work. Especially understandable considering his exhibition “Savage Beauty” is currently taking place at the Victoria and Albert museum. Amy Parsons and Rebecca Collier, in particular, have taken McQueen’s use of alternative materials and his love of the melodramatic and adapted it to suit their own style and work beautifully. Collier used brilliant inventiveness in the materials she used to create clothing out of plastic, metal and other sculptural materials. 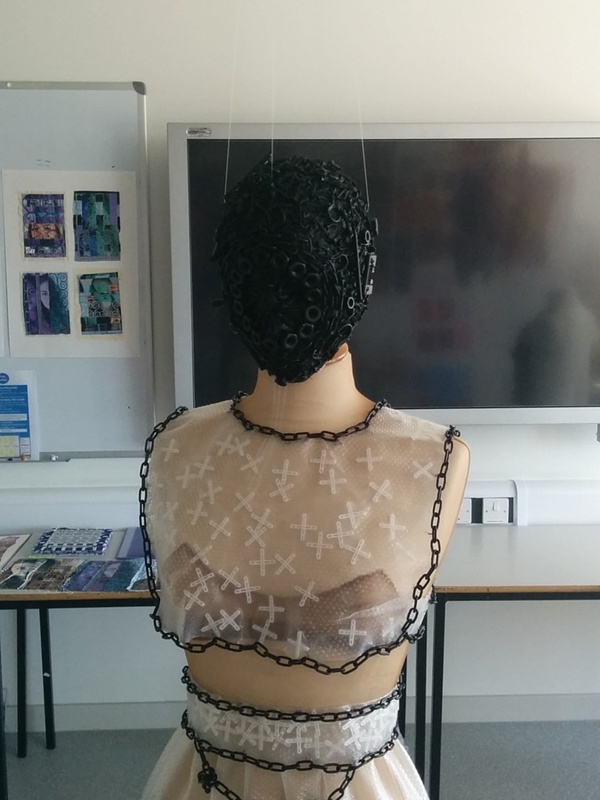 From top to bottom, the whole mannequin was considered, with automated parts inset into the masks, plastic mesh used as a lace alternative as well as chains for a dress lining. The inventive materials makes the piece all the more impressive, especially when one considers that on first viewing it looks like traditional textile, makes the workmanship that much more impressive. The alternative materials is typically McQueen and suited the sadomasochistic feel of the clothing and stood at odds to the innocent and delicate look of her materials. Parsons digitally printed her designs onto card before carefully folding these into pyramid shaped segments, attached carefully to a paper inner dress to sit together to create a gorgeous dress. Both had touched on elements from McQueen’s exhibition, but the way in which they have taken their own direction from it, shows great promise. 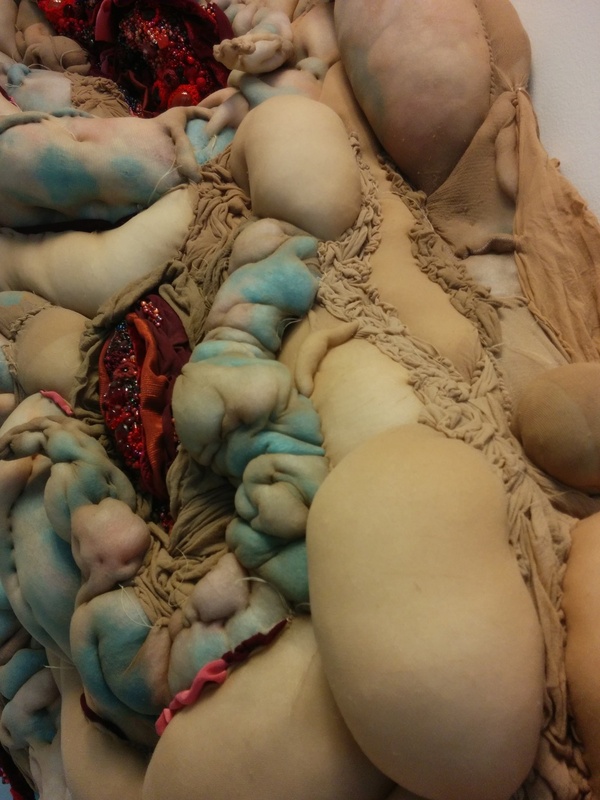 Among the rest of the exhibition there was some brilliant work from Holly Rozier, a Brighton-based textile artist who uses tights and beading to explore the juxtaposition between the beautiful and the downright disgusting. Her use of tights and beading to create skin and blood plays with similar themes of attraction and repulsion. Beautiful. My favourite area was reserved by the two resident artists of the College: Sara Sepe and Barry Williams. They have commandeered an abandoned section of the Warren Club, an old clubhouse for the cricket club, and created work in reaction to this space. Barry Williams used concrete and found objects from inside the original changing room to exacerbate a feeling of abandonment created by the building. Clever little touches stood out, using mirrors inside open lockers and strange objects to transport you away from the area. The whole installation had a feeling of an old war zone. Sarah Sepe had many different elements to her exhibition. Delicate maquettes of acetate ‘sketches’ were drawn and presented in half arches on the wall, before being displayed in the main building. These smaller pieces worked well, especially when you walked over to the Warren Club. Here, she has continued this process but created a giant nautilus shell. 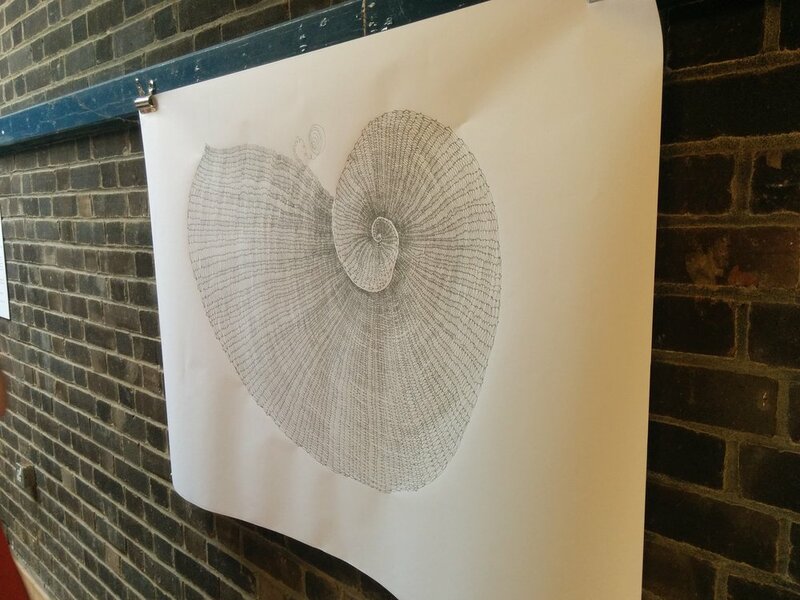 This wonderful print is made by photocopying a hand-drawn acetate drawing of a Nautilus's shell and blowing up the image to a huge scale. The detail and different processes heighten the image from a simple print, to stunning piece. There were lots and lots of other pieces which I haven’t mentioned, but as a venue on the Worthing Art Trail, I would definitely suggest checking it out. The Worthing Art Trail final weekend is the 27th and 28th of June. You can see the website here for more details.